1. Place Sirloin Roast in Crockpot and add in green peppers, onions, beef broth, soy sauce, and Worcestershire sauce. 2. Cook on low for about 8 hours or high for about 4 to 5 hours. 3. Remove the roast from crockpot, and use a food processor to chop it up. You will have to cut the roast up to fit it into the food processor. 4. Once the roast has been chopped in the food processor return it to the juices in the crockpot and stir. 5. Scoop meat onto hoagie rolls, trying to remove as much of the juice as possible. Put a slice of Provolone cheese on top of the meat. 6. Toast sandwich in oven for 3 minutes, or until cheese is melted. Well, we survived the first week of school and my first week back to work pretty well. 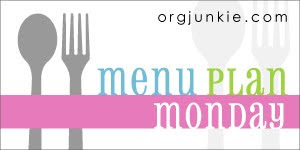 We only missed a couple of items on last week's menu, which is good for us even on a normal week. My kids love salmon croquettes, although they are called salmon patties around our house. I don't mind making them either because they are easy to make. We don't eat them a lot but when we do they are always received with a warm welcome. 1. Prepare your bread crumbs. I use a food processor and about 4-5 slices of bread to make 2 cups. 2. After opening the cans of salmon, drain the juice and remove the black skin (or as much of it as you can). Mix it with the 3 eggs and bread crumbs. If mixture is too soggy or too dry you can add in more eggs or bread crumbs. 3. Make patties out of the salmon mixture. 4. Heat about 3 inches of canola oil in a skillet. Once oil is heated, fry salmon patties until they are golden brown on each side. My husband loves these with white gravy over them but they are also good just the way they are. We have had an overwhelming abundance of green peppers in our garden this summer, and one of my favorite ways to use them up is to make stuffed green peppers. 1. Remove tops and seeds from washed green peppers. 2. Use a paring knife to cut 3 small slits in the bottom of each pepper. I do this to allow the grease from the hamburger to drain. 3. In a large bowl mix together hamburger, worshestershire sauce, chili powder and onion. 4. Stuff each pepper with hamburger mixture and place in a casserole dish. I am extremely sad, the freedom and tranquility of summer is drawing to a close for us. In just one week my little ones will be heading back off to school. Instead of enjoying this last week of freedom we will be busy, busy, busy, with school orientation, doctors appointments, dentist appointments, back to school shopping, the list goes on and on. Needless, to say, there won't be much cooking going on here.